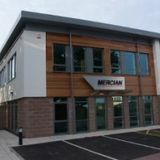 INTRODUCTION Mercian has been established as a supplier of high quality surgical instrumentation for over 50 years. 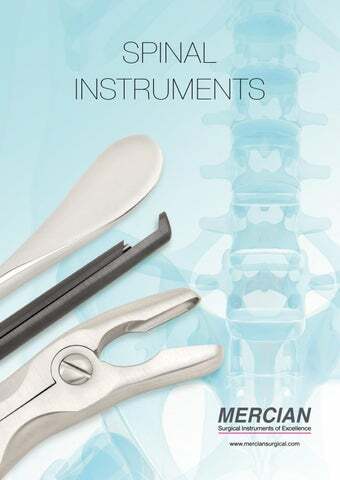 We present our catalogue detailing our range of instrumentation for Spinal Surgery. These specialist instruments are manufactured to the highest possible standards with the most modern processes. STANDARDS Mercian is certified to meet standard ISO 13485:2016. Recognised as a mark of excellence applicable to our management systems, processes, procedures and surgical instruments. We are subject to continual assessment of these procedures to ensure standards are maintained by an independent outside notified body. Annual surveillance ensures our compliance with ISO 13485: 2016 and medical directive 93/42/EEC Annex V. WARRANTY To ensure our instruments perform as expected, all Mercian Instruments are covered by a 12 month warranty covering any manufacturing/material defect. Any instrument failing these standards will be repaired or replaced without charges. CODE NUMBERS Mercian code numbers are designed to allow you to identify an instrument from only the number. Length of instrument Instrument No. 40˚ UPWARD JAW 20cm/7¾" Shaft	23cm/9" Shaft	28cm/11" Shaft working length	working length	working length 12cm/4¾"	18cm/7"	20cm/7¾"
HA7105 -19	18cm/7" SP9206-23	23cm/9"
This Specialist Retractor allows the consultant the optimal exposure to the disc with the minimum incision. The black finish eliminates distracting reflections under the microscope during surgery. The wide selection of blades available allows the surgeon full flexibility in approaches to the disc. The design of the retractor allows unhindered access around the wound with the jointed arms folding along the patients back. Jointed arms Longer arms accommodating 2 blades on each arm. Useful for multi-level approach. An advanced cervical retractor system suitable for both anterior and posterior cervical surgery including attachments for micro discectomy surgery. Standard ‘Black Belt’ Retractor with the addition of Micro Discectomy Attachments as detailed on page 60. A powerful retractor with a selection of blade depths which can be positioned anywhere along the retractor arms. Allows excellent exposure of the spine in Pedicle Screw and Laminectomy procedures. Instruments Bayonet Curette, silicone handle, 4.6mm reverse angled cup, 30cm Bayonet Curette, silicone handle, 7.5mm reverse angled cup, 30cm Penfield Dissector #4, 4mm width, Bayonet, WL 150mm, total length 270mm Short Ball Probe, 7mm, Bayonet, WL 150mm, total length 270mm Woodson Probe, 6mm width, Bayonet, WL 150mm, total length 270mm Bayonet Nerve Root Retractor, silicone handle, 3mm tip, 34cm Frazier Suction Tube, 10Fr, 230mm, total length 300mm Bayonet Kerrison, 40˚up-cutting, 2mm bite, 180mm with ejector Bayonet Kerrison, 40˚up-cutting, 3mm bite, 180mm with ejector Bayonet Love-Gruenwald Ronguer, 3x10mm bite, 180mm straight Bayonet Love-Gruenwald Ronguer, 3x10mm bite, 180mm angled up Rhoton Knife Handle, 5-1/8" WL, total length 9½"
Mercian introduce a new set of spinal instruments for lumbar spine surgery. The Mercian Lumbar Spine Set has three levels of instruments consisting of Bone Curettes and Nerve Root Retractors on the first level, Bone Nibblers and Hooks on the second level with the lower level consisting of Kerrison Punches 2mm to 5mm and Disc Ronguers. The material specially developed for SuperGliss® non-stick forceps prevents overheating of the tips during coagulation. The MT5000 Micro Torque Surgical Drill System is equipped with the most up to date and powerful micro motor which delivers high levels of reliability. The variation of handpieces available are ideally suited to Spinal Surgery. The precisely controlled Irrigation System results in the cutting tool continually irrigated to the surgeons requirements. MICRO MOTOR CABLE The sterilizable micro motor is a high performance self cooling micro motor. Brushless with a variable speed range from 500 to 40,000 RPM. Coburg Micro Surgery Stool Suitable for all micro surgery including: Neuro, Ophthalmic & ENT Surgery.